Henry Bauer on Abominable Science! Veteran Nessie researcher, Henry Bauer, has entered the fray in critiquing Loxton and Prothero's "Abominable Science!". Last month, I pointed out its deficiencies from a Nessie point of view, but Henry has found even more holes in this Swiss cheese of a chapter. He hopes to review the whole book in due time, but click on this link to get his critique of their Loch Ness Monster chapter. 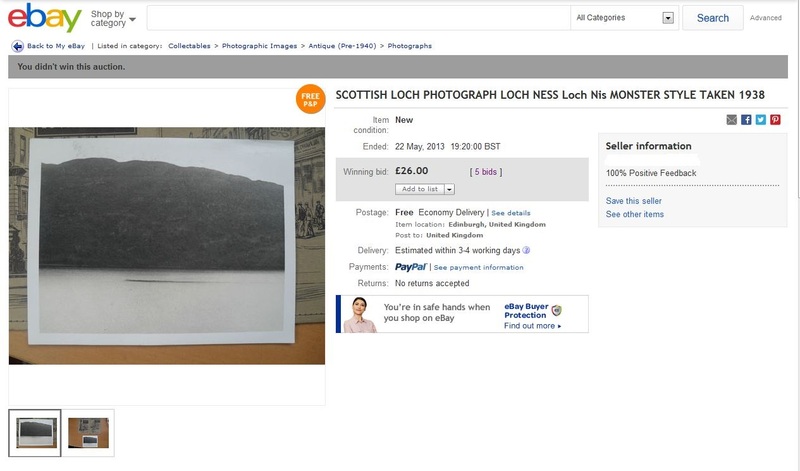 Back in May of this year, I came across an auction for a picture which was described as a photograph taken at Loch Ness in 1938. The seller was actually not quite sure if it was but thought it the most likely place. The item sold for £26.00 and that was the end of that. However, my curiosity was piqued and I took a closer look at the JPEG image that I grabbed from the eBay website. The eBay page is above but the actual image is shown below. Now this is the type of Loch Ness picture that would have been unlikely to make it into a newspaper of its time. After the excitement of the Surgeon's photograph four years previously, the bar had been set pretty high. 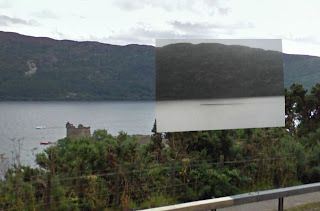 Nevertheless, was it taken at Loch Ness and what could it be? 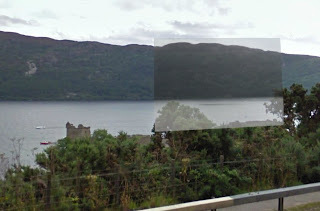 Using Google's ever useful StreetView, it came as no surprise that the picture had been taken beside Urquhart Castle at the place where the highest proportion of sightings have been recorded. Using the background hill contours as a guide, a rough location was determined. Superimposing the two pictures confirms the location and increasing the transparency of the 1938 photograph gives an idea of the scale of the object which was photographed. If you compare the size of the object (or area of water) with the boats to the left, it covers a fairly large distance in the horizontal. Perhaps 200 to 300 feet in extent using the boats as a guide. Of course, the Loch Ness Monster is not 200 feet long, but a large object could cause a similar water disturbance. Or perhaps it is just a plain old wind slick or windrow which is a common sight on the loch? By way of cross reference, I wondered if there was a reported sighting in the vicinity of Castle Urquhart in 1938. A perusal of the archives brought up one possible candidate which was reported in the Scotsman newspaper for the 7th of September. This is reproduced below. 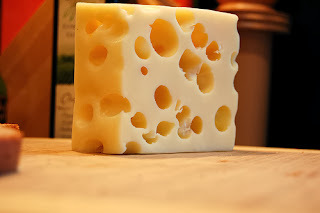 The photograph fits the article to some degree. This was a two hump sighting which was described as lower in the water than a previous sighting by a tug crew earlier that Summer. Certainly, if there is anything in this photograph, it would be low in the water. Also, the stated distance of three quarters of a mile is agreeable with our superimposed photograph. Unfortunately, such a distance is not commensurate with detailed photography. However, I am not that convinced that this is a windrow and more that this is a genuine water disturbance. It does not appear to be a boat wake as the other arm of the bow wave is not visible. A higher resolution scan of the picture would help pick out details which are merely hinted at in this low-res image. For example, there does appear to be something like water being thrown up to the far left of the disturbance. 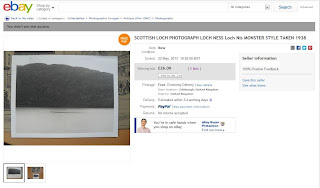 So, with this in mind, I will ask the original eBay seller to pass this article onto the purchaser in the hope that a higher resolution picture will be available for further examination. Until then, the picture enters the archive of alleged pictures of the Loch Ness Monster after being hidden from view for 77 years!